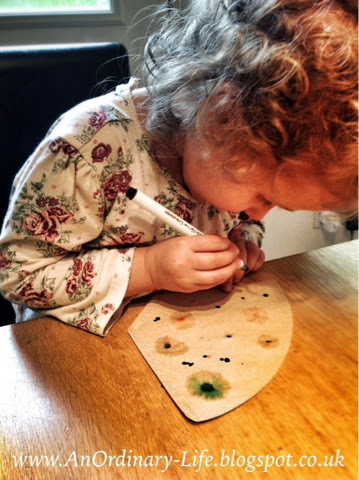 This is a really fun and effective way of introducing young children about Chromatography or for turning a science lesson into an art lesson too! 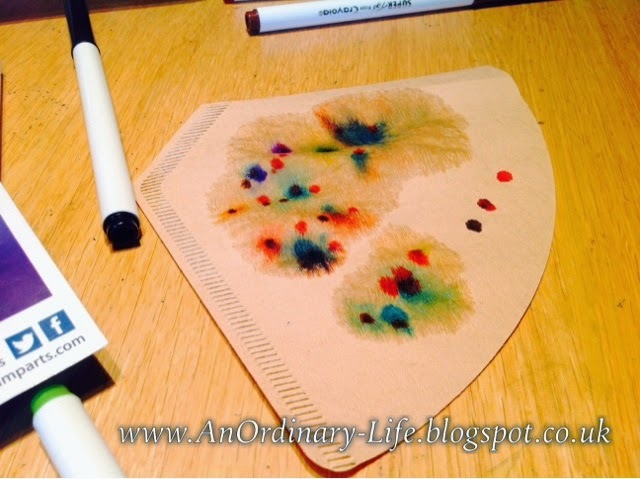 Put dots of colours, using your felt tips, on to your coffee filter. Certain colours work better than others, black is one of the best colours to use in this science project. Using a pipette add water, a bit at a time, to each drop. Watch the colours forming on the paper. Can the child describe what is happening? The colours that form the colour of the felt tip pen are separating! In chemistry, chromatography is a process for separating different components from a mixture. Chromatography is achieved by passing a sample mixture - the scientific word for this being analyte - in a stream of solvent through some form of material that will provide resistance when chemical interactions are made. I read some where that this is an interaction not a reaction. Anyway, this happens between the components of the sample and the material. 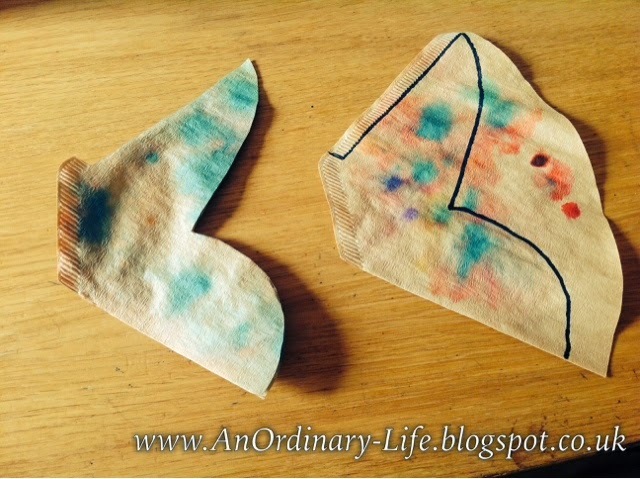 Leave your coffee filter papers that have been used for chromatography to dry. They may have to be left overnight to be completely dry. Draw a shape like this along your coffee filter ensuring that the bottom of the filter isn't cut through, this is important if you want your butterflies to work. Cut out the shape you have made on your coffee filter paper (the black outline in the photo above and then, when it opens up, you should have something that resembles a butterfly! Cut a piece of cotton thread, I cut ours to 40-50cm in length. Make two small blobs (excuse the technical terms!) of Blu Tack and stick one to one end of the thread and one to the other end. And the other end to the ceiling and for a full effect near a window like in the picture. 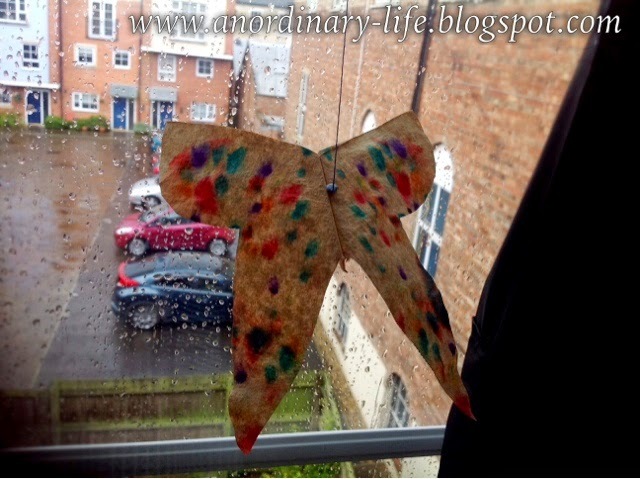 Your butterfly is complete and now a beautiful homemade decoration! If you want to learn more about chromatography, check out my post Paper Chromatography. This post does contain affiliate links this is all to help keep this blog running and for your convenience, I appreciate your support.